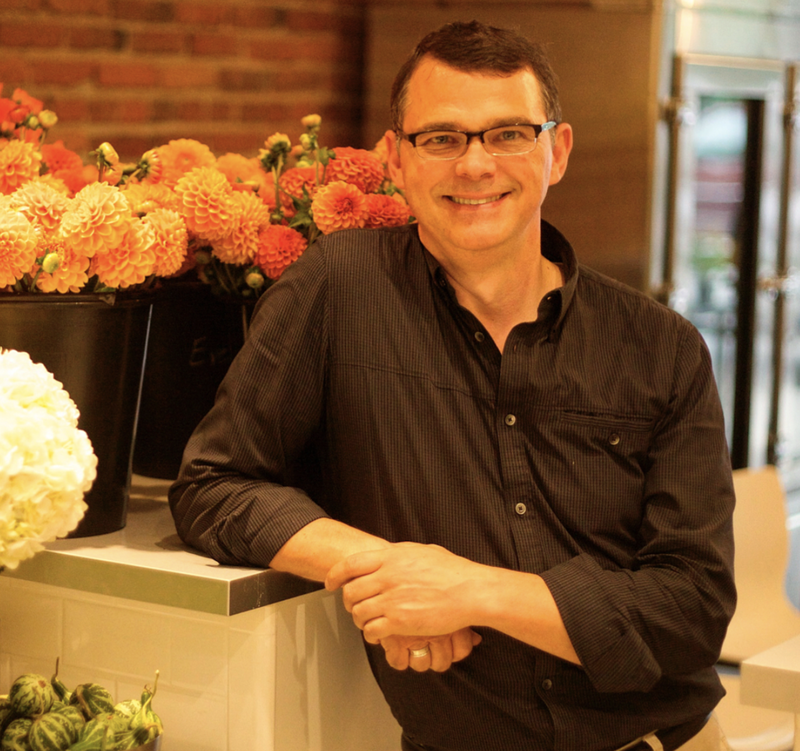 We spoke with Miles, the esteemed owner of Seattle's Fiori Floral Design. Hailing from corporate roots, he never expected he'd end up be managing a flower shop -- but loves every minute of it. He's since made a name for himself and become an active member of the Seattle floral community. Check out his story below, and his flower arranging classes here! Give us a brief introduction about yourself. What brought you into the world of floral design? I'll start from the very beginning. I was working a corporate job, and it just wasn’t satisfying, so I started to look at what else I could do — I began speaking with a career counselor. Of all things, floral design seemed like a good fit for me. After a while, I met with a businessperson who specialized in floral shops. I found out Fiori was for sale and it seemed like a great fit with all the changes going on in floral industry -- big name brands like Costco and Safeway were dominating the business and making independent flower shops obsolete. I made an offer despite the competition, though, because Fiori was highly regarded. I took a leap. What is something most people don’t know about working in the flower business? It's so much more than putting flowers in a vase! When you receive a vase of flowers, you don't realize how much energy is expended and number of people involved in creating it. The farmers, businesspeople, managers -- playing with flowers is just one small part of it. A really fun part, but a small piece of the puzzle. What are your major achievements/meaningful moments in your business thus far? Nordstrom once asked me to open up a boutique in their flagship store, which was a great honor. I did that for five years, but I eventually realized it wasn’t providing me with what I needed; it separated me from my business. I had become too much of a manager. We agreed to split, and went our separate ways, but it was an honor while it lasted. One of the most meaningful parts of my business is definitely the teaching. It was something I always had in the back of my mind, to teach classes in floral design. It came about when a client said, "it’s my birthday coming up. What I'd like to do is get some friends together and have a floral design class, is that something you can do?" We just said, "Sure!" We'd never done anything like it before. We were waiting for everybody to arrive on the day of the class, and we said, "This will either be a lot of fun or we'll never speak of it again." It was great! We opened classes to the public just to see what the response would be, and it took off. At the time, we just offered one class at a time, so we added more classes and been busy ever since. I truly love teaching classes. It really fulfills me when people leave class with a smile on their face, put pictures of what they made on social media. It makes a long day worth it. What were some initial hurdles you had to get through? I had so much to learn. I had never worked in a flower shop, and had no concept of what payroll should be— that one big challenge, figuring out what's a good level op payroll. I needed to pay my workers well because I'm always a strong believer in offering exceptional customer service. My mantra is to find a way to always say yes to our customers. Doing this can be another challenge, but it's well worth it. People have called us from 50 miles away just for our services — we just did an event with a celebrity florist in Seattle for a retirement party for Starbucks. We always find ways to get our customers what they want, even if they call with last minute order, we'll do anything. And we collaborate with other florists — I will always recommend other shops when I can’t say yes rather than just turning customers away. Any advice for other people who want to start their own business and pursue what they love? Get experience in the industry you’re interested in. Whether its volunteering or arranging an internship or getting help just washing buckets — just so you can get in and see what it’s really like. People have a distorted vision about what the industry is like; like I mentioned, there’s a lot more to it than just playing with flowers. Also, find people you respect in the industry. If you’re lucky, you'll get to meet them, and if you're really lucky you get to collaborate. Alicia is one of those people for me. She started a blog on the floral industry, which was rare in and of itself, and was sharing beautiful pictures and info that's rarely found outside of the floral community. I followed her, admired her blog, we started chatting and I was eventually featured on it. One day, she walked into my shop, we got to talking, and we just hit it off. I didn’t know that within a year or two she’d be moving to the area and w'ed get to collaborate. When I need help -- on Valentine's Day, Mothers Day, all the big ones -- she helps me out. A while back, Alicia introduced me to Francoise Weeks, who has another very distinct look that I've always admired. We hit it off as well, and I mentioned to Francoise that the three of us should teach a class together. We each have our own distinct styles but all share the same ethos, and all have something different to bring to the table. That’s how this class was born. I have the respect of my peers and the opportunity to work with people I've admired for so long, and that’s one of the highlights of my career. It's like if you’re in the film industry and you get to work with Brad Pitt. I'm really lucky.